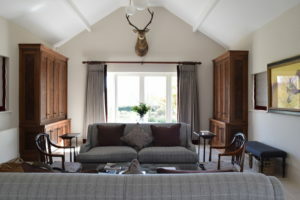 The clients of this light and spacious modern country home had a clear idea of what they were looking for when they approached fine furniture makers, Guild Anderson. The brief was to design some free-standing storage for a collection of shotguns and field sport equipment. A keen shot, the client has several sporting guns to care for and store safely. The final design is a matching pair of cabinets in lacquered walnut, based on a traditional bureau design with lockable doors. Each comprises of an upper and lower section with a moulded cornice above three separate cupboards, with the middle section enclosing the gun case itself. 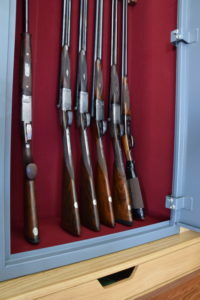 The bespoke metal box for this was made to measure by a gun case specialist to Guild Anderson’s specifications, to ensure it would integrate neatly and securely into the cabinet design. Guild Anderson’s designers worked with the police to ensure the features of the design complied with all gun safety requirements. The overarching success of this concept is that it uniquely does not look like a gun cupboard. 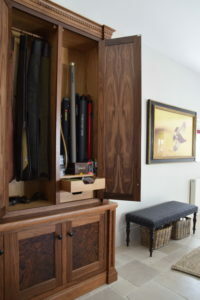 A niche piece of furniture, there are few makers of bespoke gun cabinets. The Americans make a bespoke but rather bigger, chunkier version compared to this refined English design. Here, the outline resembles the detailing of a 19th century bureau or secretaire bookcase. Each section has three beautifully figured cupboard doors which are lined in beechwood while the interior of the gun safe is lined in red baize. Both cabinets are made in a lacquered solid walnut with an inlaid panel of a burr walnut veneer. The American black walnut veneer has been oiled and polished to draw out the striking grain and excellent patina using a traditional wax finish. The fact it has been made to store guns does not compromise the undeniable craftsmanship of the cabinet maker’s eye. The resulting matching bespoke cabinets are stunning. Both practical and beautiful, they make for an impressive backdrop to the room.